Starbucks is known for their fabulous treats. They have many coffee drinks that are fun, but they also serve up many delicious items such as their pumpkin bread and their banana bread. Now it is time for their simply scrumptious Starbuck’s Petite Vanilla Scones. I can’t think of a way that is more decadent than to go to the coffee shop in the morning and treat myself to a fancy coffee and a bakery treat than this. A decadent breakfast is something I typically only enjoy on the weekend. Now you can enjoy these scones any day of the week, and this copycat recipe tastes just like their does, but yours will be made with your love and attention. For this recipe, the vanilla bean is very critical to success, but you have some options. You can buy vanilla beans; there are many places online that sell well-priced vanilla beans. I have also found that Costco wells vanilla beans at good prices. You may also want to consider using a vanilla bean paste. Vanilla bean paste can replace vanilla extract if you don’t mind the beans. To get this recipe, we need to be a little picky on the ingredients. You should use cake flour; it will give you a better result than all-purpose flour. The vanilla is important, so you may need to buy some vanilla beans or vanilla bean paste. If you want to splurge on the vanilla, extract you can. The recipe requires you to use heavy cream. Don’t to use milk, half and half, and not any form of fat-free milk. You need the full fat of the cream to make these set up well. These scones are not hard to make. Don’t be discouraged. Take your time and you will soon be making these scones. Meanwhile be sure to check out some of my favorite Starbucks Coffee Drinks! 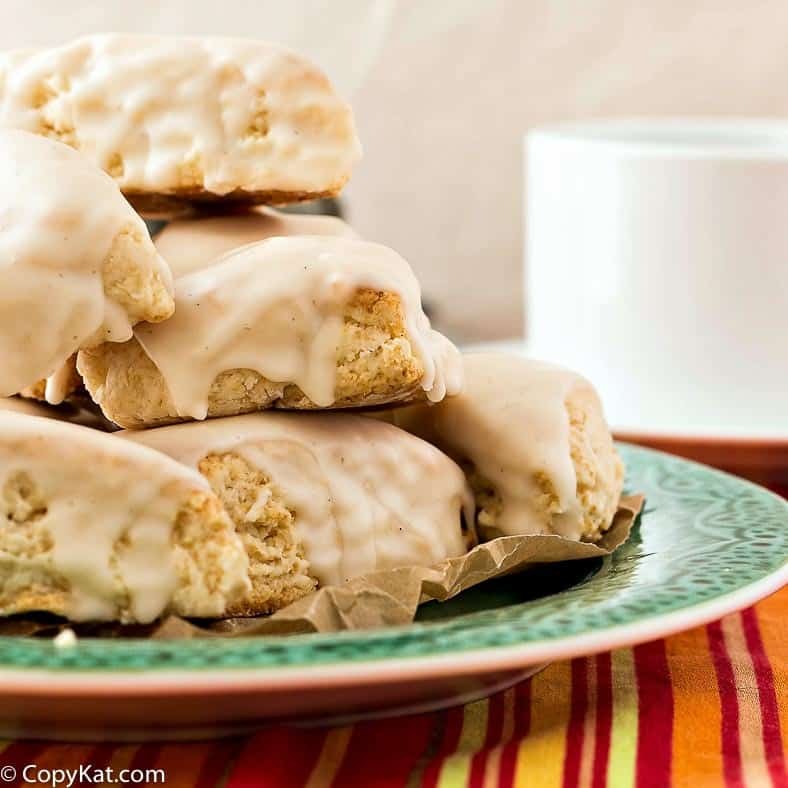 You don't need to leave some to make Starbucks Petite Vanilla Scones at home. For the Scones Set a rack in the center of the oven and preheat to 425F. Whisk the flour, baking powder and salt together in a medium bowl. Add the cream cheese and work it in with your fingertips really well until there are no little “pebbles” of cream cheese visible. The flour should seem very slightly mealy but not gummy. Whisk together the heavy cream and vanilla. Make a well in the center of the flour mixture and pour in the cream. Stir gently to combine (I use a knife to avoid getting too crazy with mixing). When the dough has mostly come together (there may be a bit of loose flour in the bowl), scrape the dough out onto a floured surface and knead 2-3 times until the dough is fairly smooth. Form the dough into a rectangle 6” x 5” and about ¾” high. I use a bench knife to help me get a nice, rectangular shape. Cut the dough in half the long way and then cross-ways into thirds for a total of six small rectangles. Cut each rectangle into 2 small triangles and arrange on a parchment-lined baking sheet so they aren’t touching. Bake for 13-15 minutes or until lightly golden brown. Remove to a wire rack to cool completely. Glaze. Let the glaze set up for a couple of hours before serving. Reheat to just warm in the toaster oven or for a few seconds in the microwave. Whisk together the powdered sugar, salt, milk and vanilla until you have a thick but pourable glaze. Place the scones on a cooling rack set over a cookie sheet or parchment to catch drips. Spoon a generous amount of glaze over each scone to completely cover the tops. Allow the glaze to set up for 15 minutes. Then, rewhisk the remaining glaze and repeat the glazing process. Let the glaze set up for at least two hours. Well, it’s never too late to discover a recipe! I see reply’s are posted in “2016”. I too as others have just discovered Scones. I have searched your directions but cannot see where you added the sugar. I assume it’s whisked with the flour dry goods. Just checking! These look delishous. Adding some nuts. Thank you!!! Last night my friend and I were lamenting about how we loved the Starbucks maple scones which you don’t see very often. Have you recreated them? I haven’t tried recreating these before. Gotta try this, I just discovered I love scones. I can’t wait to give this recipe a try. These scones look scrumptious. I love Starbuck’s scones and I can’t wait to try this. 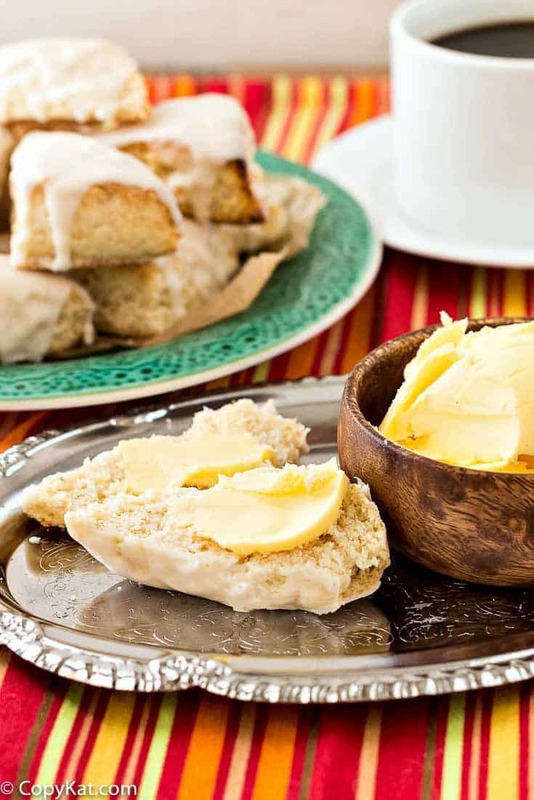 I always thought scones would be difficult to make but this recipe looks pretty simple. I did find “the crush” vanilla on Amazon. It’s pricey but I’m going to try it out.